Couples wedding showers can be a lot of fun. Add the whole Halloween costume party thing to the occasion and you've got a real blast on your hands. I just found the perfect invite for your combination Halloween-Shower. The design puts the spotlight on Frankenstein and his bride. I for one can't think of a better couple to represent this kind of event. The designer who created these 'Love At First Fright' invitations calls them "more mushy than monstrous" and we agree. They are beyond cute and the pink hearts in the background just add to the adorable-ness. They're easy to personalize with all of your party particulars and come with a standard white envelope AND a 100% satisfaction guarantee. Ideas to make it even more fun! It'll be easy to surprise the happy couple. Just tell them you're having a regular Halloween party. Just get the rest of the guests there a half an hour earlier. The lovers will get the message as soon as they walk in and see all of the gifts and guests there waiting to greet them. Decorate for Halloween but add a bunch of cupids and hearts where they'd least expect it. Ask your guests to dress as famous couples. Lavender. Just the name alone sparks the imagination and brings the soft scent of this precious herbal flower wafting through the mind. It's the perfect soft color and fragrance for a brand new baby girl. And let's face it. Not every mother-to-be wants to be drowned in pink. Some would definitely prefer the purpliciousness of lavender. If your planning a baby shower for the expectant mother whose favorite color just happens to be the softest shade of purple, I think you're going to find exactly the right invites... right here. Polka Dot Border - Stylish and contemporary baby shower invitations for a baby girl. Damask & Dress - Lavender ruffled dress with pearls and bows on a white and gray damask background. Sparkly Glitter - Lavender glittering rain drops with chic stylish typeset. All of our invitations are personalized and full-color printed on your choice of high quality paper stock... with "basic" highly recommended for any of the featured designs we're showing you here. Vintage Typography - Modern retro fun! Mod Chic Chevron - Unique, modern stripes and lettering. 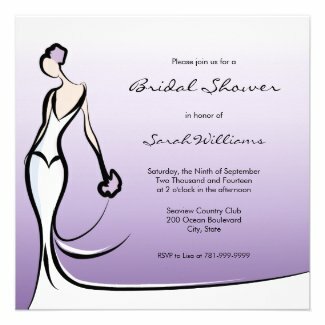 Pretty Paisley - Purple and lavender pop on this adorable invite. They each come with a white envelope and a 100% satisfaction guarantee too which means if you're not happy with the way they turn out, they can be returned for a refund... even though they were personalized just for you. Cute Teddy Bear Vintage Lace - A sweet teddy bear to welcome friends and family. Cupcake - What's sweeter than this cute cupcake? Your baby-to-be! 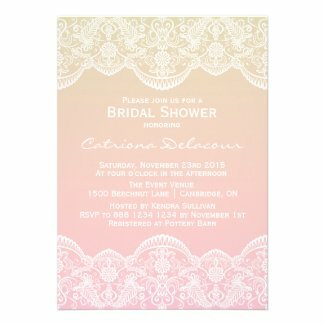 Vintage Toile - A baby shower invite that's fit for a princess! Our unique square invitations measure a big 5.25" across... both ways and all of the rectangular ones shown here measure a whopping 5" x 7". Click on each of your favorites to learn more or visit the following link to see everything that's available for a baby girl whose going to be showered in lavender. Big Bold lettering let's them know the shower is for a beautiful BABY GIRL. Each of these modern designs features traditional shades of pink with a twist. Cute doesn't even begin to describe them. Each comes with a standard white envelope and a 100% satisfaction guarantee. Click on your favorite to learn more! Oh my! How cute is this for a Halloween bridal shower? I don't know about you but I fell in love the moment I saw these invites and began thinking about which one of my friends I could persuade to get married so that I could use them. If you've got a friend who's planning a Halloween wedding or whose shower will be taking place at the end of October, I urge you to take a closer look at this invite. The design features a 3 layer cake all done in bright Halloween colors with some cute pumpkins sitting on top. Modern, fancy typography finishes the sophisticated look that's sure to impress all of the guests... even the pickiest mother-in-law to be. They're a big 5.25" x 5.25 square which will require a few cents more in postage but what's a few cents when the invitation looks this good! They come with a 100% satisfaction guarantee and a standard white envelope which is suitable for mailing these darlings out to all of her friends and family. Ombre is hot right now. You'll find everything from shoes and clothing to hair sporting this fun color fade. And yes, you can find it for your bridal shower invitations too! Ombre happens when several tones of the same color gradually blend into each other --- graduated from light to dark or vice versa. But there's nothing faded about the beauty of it. I've always loved an elegant monotone wedding theme and this style gives you the elegance of a single color with a bit of unique interest. 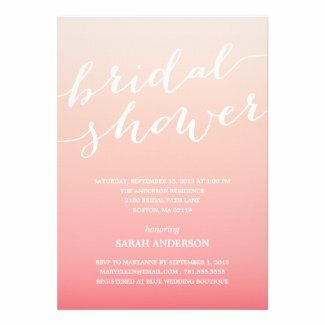 If the bride has chosen a shade of this graduated gorgeousness for her bridal colors, or even if she hasn't, ombre bridal shower invitations in any hue are sure to be a hit. We've collected some very pretty ones here in several colors to give you an idea of just how chic they can be. The rectangular invites shown above measure a large 5" x 7" and the square shaped one is 5.25" across, both ways. They all come with a standard envelope and a 100% satisfaction guarantee. You'll get fast turnaround too with most orders being processed within 24 hours. As you can see on these yummy photos of cake, the ombre color style can be incorporated into your shower in more ways than just the invites. Use it for the food, party favors and decorations too! Here's a great idea for your next baby shower: collect words of wisdom for the mother-to-be. We all know that raising baby isn't all about sweetness and light... after all there's poop and crying to deal with... sometimes. and there will be plenty of times when the new parents become a bit frustrated when a few words from you can truly help. Everyone has a bit of sage advice to share; be it from their own experience or things they learned from their own moms. Have guests share their best tips in a way that the new mommy and daddy can save them as a keepsake and keep them handy for when they'll really need and appreciate them. But what's the best way to collect and keep this gathered knowledge? I'll explore and share several ways here so that you can decide which will work best for you. These cute circus-theme cards are actually created on chubby business card sized cards. The design features a red and white circus tent style border at the top and bottom a cute little elephant and the words, Words of Advice for the mommy to be. The red and white stripe also appears on the flip side. They measure 3.5" x 2.5". They might seem small but there's plenty of room for a couple of words of advice. Sold in a pack of 100 so that there's plenty to go around and even extras in case anyone slips up and makes a mistake. These can be kept together and handy for the new parents in any business card holder you'll find online or in a local store nearby. Postcard-sized cards will give your guests a bit more room to share their best tips and tricks for keeping baby and his/her parents happy and healthy. These can be kept together with a simple ribbon tied around them or you can purchase a box, basket or even binder and postcard holder sheets to create a book of them. There are a lot of different design styles to choose from so you can find something that matches the shower theme or baby's gender. Distributing them can be done in one of a couple of different ways. Send the cards out with the invitations and ask guests to fill them out and return them on the day or the shower. Pass them out at the shower and have guests fill them out there. My best advice is to save them for the day of the shower because let's face it, someone is bound to forget to return theirs AND it serves as a fun way to get people talking as they fill out their cards they'll surely start sharing advice with each other. If anyone can't make it to the party, ask them to share something when they call in their RSVP. However you decide to do it, after all the cards are filled out, you can have each person in attendance read theirs out loud. Make a game of it by having everyone vote for the best bit of advice. If you're attending a baby shower and your advice wasn't asked for, you can still share it by way of a friendly greeting card that can be given along with your gift. In fact, after baby is born, your card may become the better half of that combination if you're sharing something truly useful. These cards are printed on high quality card stock and measure 4" x 5.6". There are lines inside where you can write your thoughts. by visiting the following link.